Good morning fellow scrappers! It's a very wet morning here in the North East--it's been raining non-stop for the past 3 days and I'm starting to forget what that big bright round yellow thing in the sky is. We haven't seen the sunshine in ages it seems. So here's hoping for a bit of sunshine soon. That brings me to my current page & why I picked such bright colors for it. I made my own sunshine with this layout! Plus the theme of the layout is one that is close to my heart. 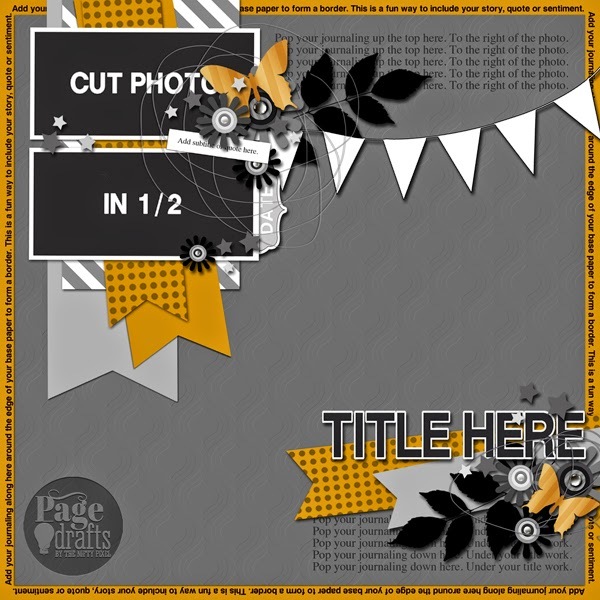 I've used papers by Basic Grey--Lemonade collection (papers that I've had in my stash for an eternity it seems) & based my design on a fabulous new sketch by Page Drafts. In fact, Page Drafts is having another one of their challenges--more on this in a few. Here I am holding my son when he was approximately 3 months old. Why does this seem like it happened eons ago when it was only barely early last year? Sigh....time is passing by just too fast for my liking & I simply don't want my little peanut to grow. :-( I'm loving this stage in his life where he's small & I can keep him safe by my side at all times. I'm guessing many moms feel this way at some point in our children's lives. Here's the sketch I've based my design on. Page Drafts is having a "One of a Kind" themed challenge that will be going on for the entire month of May. It's centered around Mother's Day but it's not limited to Mother's Day. One can create a project based on anything that you consider to be "One of a Kind'--any event, person or experience that has a special meaning to you. You can find all the deets here. I have the pleasure of playing along for this challenge since I'll be guest designing for Page Drafts later on in the month. I'm quite honored since I've been a fan of Emma & her work for a very long time. I've done a bit of stamping & some masking to create the background of this page. There's lots of layering going on & the usage of foam tape & pop dots are noticeable especially in this photo. I really love giving the elements of my page a bit of dimension and foam tape/pop dots are the way to go for me. To create these hearts I used a template by Crafters Workshop (Grunge Hearts). For some of the hearts I outlined them with a thin black pen, on others I only inked them with Shabby Shutters Distress ink & on others I combined both the outlining and inking. I'm so in love with my stamps! lol Just a random thought...I used stamps to create the sentiment going around the entire border of my layout and to give my layout it's title. The floral flourish seen here is a rub-on by Basic Grey. What layout would be complete without some sort of floral cluster? My latest fave embellishments are flair buttons! Ohhhh, I'm so enjoying these lately. They are great for tucking into clusters which is what I've done here. These particular ones are from a fabulous Etsy store called Panda Eight Designs. There's my mini flocked teddy bear again! These little guys seem to make a cameo appearance on just about all my pages that involve my son. To me they represent childhood which is why I use them so much when scrapping about my son. My journaling stored in a scroll which is my fave way of storing my thoughts. You can find a tutorial for these journaling scrolls here. 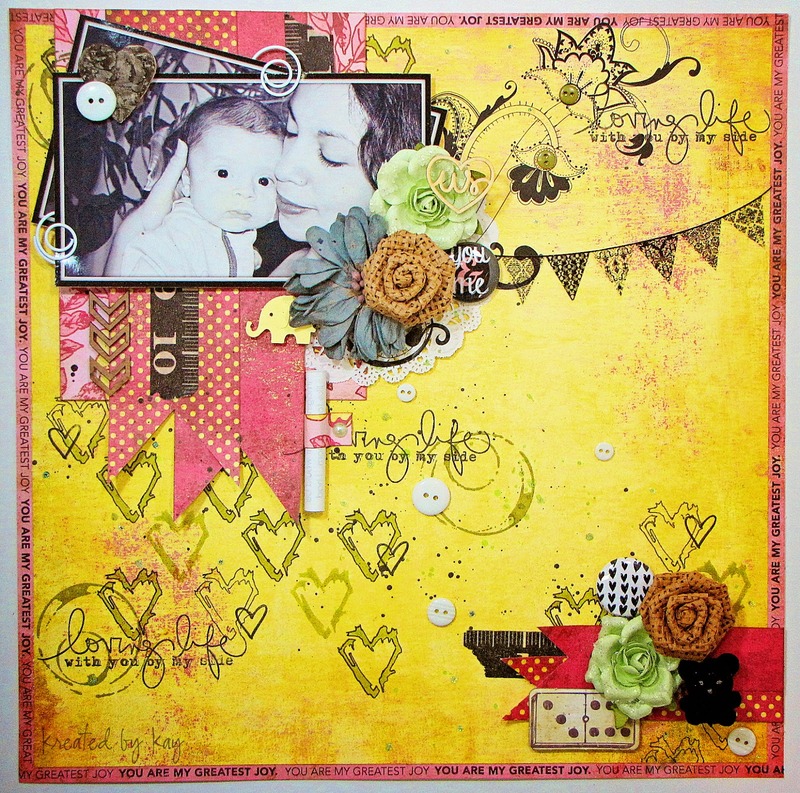 Thanks for stopping by & make sure you stop by the Page Drafts blog & play along if you can! There are some fabulous prizes up for grabs...but you gotta be in it to win it!